Nitrogenous oxides were likely deposited in bodies of water, including oceans and ponds, as remnants of the breakdown of nitrogen in Earth's atmosphere. Atmospheric nitrogen consists of two nitrogen molecules, linked via a strong triple bond, that can only be broken by an extremely energetic event—namely, lightning. Atmospheric nitrogen consists of two nitrogen ATOMS joined by a strong triple bond, not two "nitrogen molecules"! ! ! ! Middle school and high school students who have taken basic chemistry know this. A pond would have needed a source of fresh or slightly salty water to freshen it besides rain. It would also have needed a channel to empty the overflow. And a source of underground heat to prevent freezing in winter. I prefer the ocean scenario in a protected cove near land, with an underwater volcano. I would think that the UV light would be more effective in destroying nitrogenous compounds in a pond than in the ocean because the UV could penetrate all the way to the bottom of a pond whereas is could only penetrate the top layers of the ocean. Atmospheric nitrogen consists of two nitrogen ATOMS joined by a strong triple bond, not two "nitrogen molecules"! ! ! ! Middle school and high school students who have taken basic chemistry know this. "Atmospheric nitrogen consists of two nitrogen atoms, linked via a strong triple bond, that can only be broken by an extremely energetic event — namely, lightning." I suspect Ms Chu corrected her copy, but phys.org doesn't proof their articles. And a source of underground heat to prevent freezing in winter. The time in question was around the Late Archean, when almost everywhere on Earth was warm at the very least. back last July 4th, 2018. From Billy Meier, who knew it February 3rd, 1988. Just added to the list of hundreds of things Meier printed in published copyrighted books years and decades before all the scientists. Time for you all to see what else you don't know about science and space. So, we are all pond scum! It is laughable that any scientist would think the amazing thing we call life could come from a 10cm pond because it has some nitrogen in it. It is superstition and a myth, nothing more. Lol. Says an idiot that believes in all-seeing sky daddy! Life as we know it is nothing but carbon chemistry. There is no need to suppose anything mystical about it. Energy gradients, abundant carbon and other common elements, stable aqueous environments, and lots and lots of time. No magic. Just chemistry. Just saying something is true doesnt make it true you know? Only 2 places where that happens - the psychotic brain and the religionist brain. Must be the same brain. Interesting constraints, but the conclusions seem a far reach. On the plus side, I note familiar astrophysicist and excellent early planet hunter D. Sasselov is one of the authors. 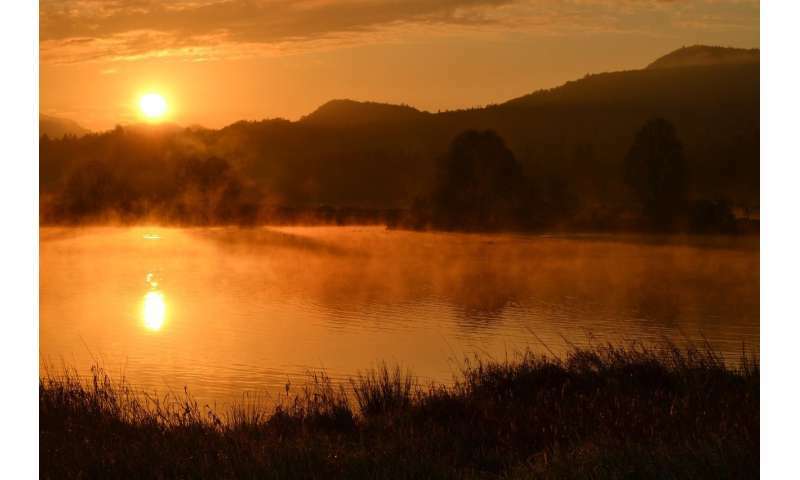 When biochemists analyze early habitability they will inevitably conclude that concentrating catchment systems to ponds, often in combination with evaporation, are more akin to their own test tubes in getting reactions going. They also set an artificial time limit at 4 Ga, perhaps considering the hypothesis of a Late Bombardment [ https://www.natur...-01074-6 , https://www.natur...8-0564-3 , https://phys.org/...lar.html ]. When the mainstream of biologists and geologists study the problem, they conclude from evolutionary evidence that life evolved in ocean hydrothermal vents [ https://www.natur...l2016116 ] where coincidentally pore systems can concentrate dilute chemicals 1000 times for every mm pore. The integrated evidence is that life can have evolved early on [ https://www.natur...8-0644-x ], perhaps before there were any plate tectonic continents (but perhaps volcano islands)..
That said, this paper that concentrates on the late 4 Ga of climate, also neglects the early high surface UV irradiation that an anoxic atmosphere would allow. They also neglect that ammonia will be produced from N2 in vents exactly when the NOx concentration is low [ https://www.ncbi..../9759725 ]. @TGO: What we call evidence religionists call 'laughable'. Likely because the facts laugh at them: the universe is now known to be 100 % mechanistic. To be precise, the article discuss a result where it is shown *not* a myth that life could have evolved in ponds. But the myth is that it could not - which the comment you cite evidently peddles in. Oy vey, religion dies hard - though I note even US is moving rapidly in the direction away from the Bronze Age invention of The Asylum and towards The Enlightenment of the modern world. The problem is - AFAIK - not the CHNOS or metal components of a biochemical machine cell, such sources were abundant on Earth and we can see life evolved. Even if the paper show we do not know all the sources and sinks yet. Or even if there were any ponds at all! The problem is the P component in CHNOPS. It is very hard to find mineral sources, even in vents, a condition current, often P limited, biomes can attest to! Since all the ingredients were there, it could just as well have originated in the atmosphere. Oy vey, religion dies hard - though I note even US is moving rapidly in the direction away from the Bronze Age invention of The Asylum and towards The Enlightenment of the modern world. It is truly amazing that so many people, most who think they are so extremely intelligent, can't understand in God but they have no problem with life springing up circumstantially/spontaneously. Even if you add combinations of various elements you will indeed get some reactions of various types but once it's finished you will NOT have life. Go ahead, add any combination in the vacuum of space or simulated one and guess what? You get the same, various reactions but NO life. We can't even find life anywhere our probes have gone and one would think earth would have somehow seeped life out into/onto other planets. So come on scientists of the world, give up all your theories of how life began and just agree it's naturally impossible, doesn't and won't happen. God and how ever you want to imagine him/her (He) is the source, He decided the type of planet all forms of life (plant, animal, human) would need to survive. So learn to life and believe in this alone. What makes you think it springs up spontaneously? What makes you think it isnt a fairly common and routine result of simple electrochemical processes? Whats that? Because your priests say it doesnt? Well they have to earn a living too dont they? How do you know? Are you a chemist? Again, how would YOU know? And what percentage of the universe have we explored and in what detail? Your book is all about people who never existed and events that never happened. Evidence tells us this. And so the god who wrote it is either an incompetent or a liar. And why would he LIE to you in order to find out how much you TRUST him? And why would you ever trust such a lying incompetent when he tells you that in order to live forever all you have to do is accept the notion that anyone who doesnt believe in him cant be honest, or decent, or trustworthy? IOW everything you ever wanted in return for being a bigot? The universe may well have been created by a god. But it definitely wasnt YOUR god, that much is certain.